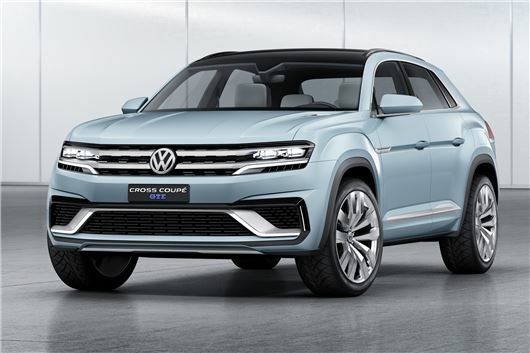 Ahead of production in late 2016 of its new 7-seater SUV at Chattanooga, Tennesee, Volkswagen unveiled a third 5-seater concept car called the Cross Coupé GTE at the Detroit Show. This is a plug-in hybrid with all-wheel drive, and previews Volkswagen’s new US look, combining German engineering with the American way of life. Together, all three concept cars – the CrossBlue presented in Detroit in January 2013, the CrossBlue Coupé most recently shown in Los Angeles in November 2013 and the Cross Coupé GTE are intended to display a wide spectrum of SUV variants that can be built on the VAG's modular transverse matrix (MQB) subframes. The Cross Coupé GTE measures 4,847 mm long, 1,736 mm high and 2,030 mm wide. In E-Mode, activated at the press of a button, the Cross Coupé GTE can travel in zero-emission mode for up to 20 miles or 32 km, and in this case the 85 kW rear axle electric motor alone drives the vehicle, with the V6 FSI decoupled from the drivetrain by disengaging the clutch and shutting down. But as soon as the six-cylinder engine needs to be restarted due to the battery charge status or other parameters, it engages smoothly in the drivetrain again in a fraction of a second. What eventually we all need to know is what real world mpg these vehicles plug in hybrid vehicles are going to produce in urban , cross country. and dual highway/motorway driving. 1) replacement battery frequency and cost. It will be interesting to see at what stage "marketing" allows this information to emerge. All such info is missing from the article above.